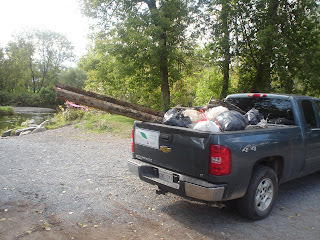 Through work recently I aided in organizing a shoreline clean-up. 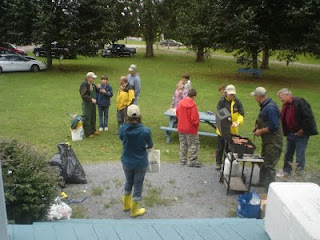 The Kennebecasis Watershed Restoration Committee (KWRC), along with TD Friends of The Environment, and a multitude of volunteers cleaned up the river banks of various streams in the Kennebecasis Watershed. This is not the first time I have been involved in this exercise and it always astounds me how much garbage we can pull out of the river. The amount is not the only surprise, the various items are just as surprising. We pulled out tires this year again. There is no need for anyone to throw their tires into a dumpster let alone the river. Thanks to New Brunswick's Tire Stewardship Porgram we simply have to return the tire to the local tire shop. The guys at Adair's Tire in Sussex Corner have always been friendly when we take scrap tires to them. Another item we often pull out of the rivers are drink cans, bottles, and boxes. This again is ludicrous. We pay a dime for every drink container we purchase (milk products being the exception) and we stand to get back a nickel if we return it. This again is part of New Brunswick's effort to reduce litter (you have to check out this website), yet people still throw it out. When the KWRC returned the cleaner and unbroken containers collected from the rivers we received $6.90 from Norrad's Recycling. This is money that others simply threw away. Bicycles might be the biggest surprise for those who worked the shoreline clean-up. We removed three bike frames from Trout Creek. A bicycle is not easy to destroy, especially the frame, so I do not understand why we keep finding bikes in the rivers. It is my guess that thieves make off with these bikes, take their joy ride and then ditch them in the river. Meanwhile a young boy is wondering what happened to his bike and his parents are still trying to pay for it. Electronics, used diapers, plastic bags, fast food containers are all frequent finds as well. I know your car is your pride and joy people but if you can't get out of your car long enough to enjoy a meal then don't eat. If you do eat in your car then atleast keep the trash there until you get home. I recommend reusable grocery bags to those uncaring litter bugs that throw plastic bags around, now a days reusable bags are cool and hip so why not? The Kings County Region Solid Waste Commission works hard at reducing litter and illegal dumping. They often host Household Hazardous Waste Days and E-Waste days, where people can drop off such waste at no charge so there is no need for volunteers to pick out aerosol cans or computer and tv monitors either. It was great though to see how many people turned out at the clean-up. 30 people showed up and signed in with others who took part without signing in. They braved the cold waters and a cool fall day to make a difference and to those people I tip my KWRC hat. A special nod goes to Rosemary Moorehead who at a youthful looking 70+ years old collected three garbage bags of waste on her own. Way to go Rosemary.